On a spontaneous whim, I drove nine hours today - nine - to see my favorite boyfriend. And. I. Am. (as the title says) So. Freaking. Pooped. 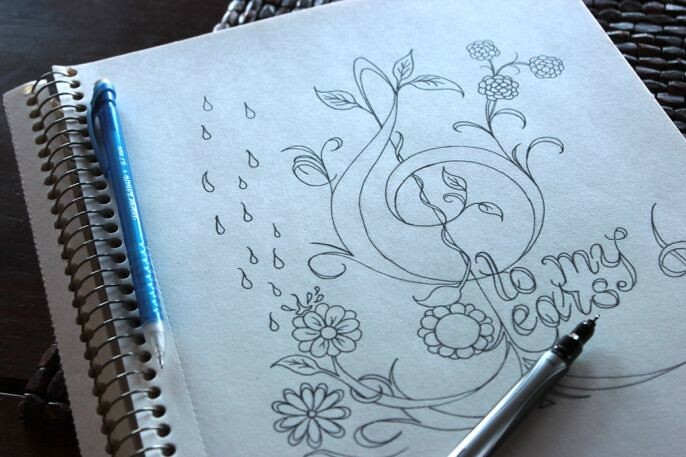 This is the drawing that was nearly completed this weekend and, as one reader put it, I'm enamored with swirls. Just call me swirly girl. Can you tell what it says? Hint: it doesn't say swirly girl. Feeling a bit giddy, ditzy, and very much in need of a rather large glass of wine as I wait for my favorite boyfriend to return from the office. This is a week to play, paint, read, relax. Hope I don't have to cook. Your endless talent is amazing! To someone who has trouble with Paint-by-number, I am in awe of freehand art. Have a great evening with the boyfriend (your secret is safe with us). I just love your drawing and I can't wait to see the colors you will use. Have a great time with the favorite boyfriend :) I hope you got your glass of wine too. Why, "Music to my Ears" of course! But then, I'm a singer, I should recognise that treble clef :-) It's a beautiful picture. Hope the driving was worth it! The wine sounds goood. If you do have to cook, do it with wine... and then when the bottle is gone you will demand to be taken to dinner! I love what you are doing with this artwork, Swirly Girl! Make more please! I think that you have a hit on your hands here. I am always seeking new art for my studio (hint, hint) and especially if it includes my words of the year. Still seeking the right stuff for that. Enjoy the day, and the boyfriend!